"All forest places are places of rest, and meadows and valleys are even more so in their nature. Wawona combines them all, and indeed I do not know a more idyllic spot. Seclusion is in the very air, and its beauty is of that gentle and perfect quality that does not so much command one’s admiration as it quietly captivates one’s heart...and I for one always feel that if Yosemite (Valley) has the greater glory, Wawona has the deeper charm." 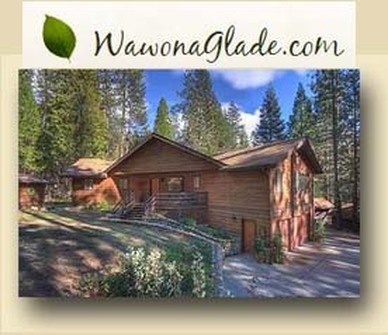 WawonaHome is our vacation rental home located in beautiful Wawona, inside Yosemite National Park. It is a 2400-sq ft., two story, 3 bedroom home with 2 1/2 baths, a large living room with fireplace, dining room, kitchen, loft area, laundry room, garage, and 2 decks. It's kid-friendly with a foosball table, a pool table and a ping pong table in the garage, and a separate TV in the kids' room for parents to enjoy some peace and quiet while the kids are having fun. It is within walking distance of the library, the Pine Tree Market, the river, the Wawona school (where there is an athletic field and a basketball court), and several popular trailheads. The house is equipped with a number of amenities, including, a 42 in. HD TV with NETFLIX streaming movies, PANDORA, surround sound, a large collection of DVDs, music CDs, and Yosemite-related books, laundry room, fireplace, and all linens and towels provided. Dining room table seats 10. The home is managed by a property management office which provides it with maintenance personnel and housekeeping. The management company also sets all rates for our property, and handles all rental transactions directly with the guest. check our "RATES" link above.